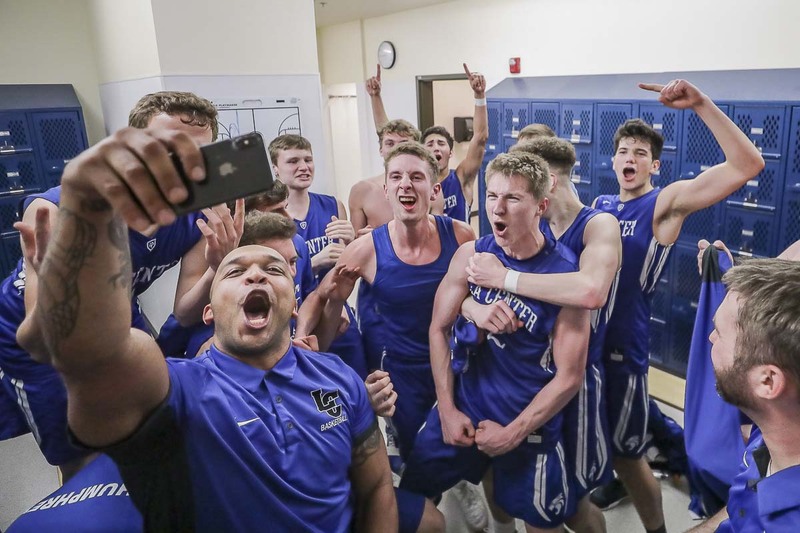 VANCOUVER — It has been a few days since La Center clinched another Trico League boys basketball title. For the players and coaches, it is their job to focus on what’s next — the district tournament. Still, when this season is complete, the Wildcats will be able to look back on how they won the league title and just smile. Trailing by eight late in the fourth quarter? They got this. Trailing by five with a 90 seconds left in overtime? They got this. And they got it done with everyone on the court making a contribution. That is the story of the 2018-19 La Center Wildcats this season. They improved to 18-2 and are No. 2 in the state’s RPI heading into the postseason. “We have a really deep core. 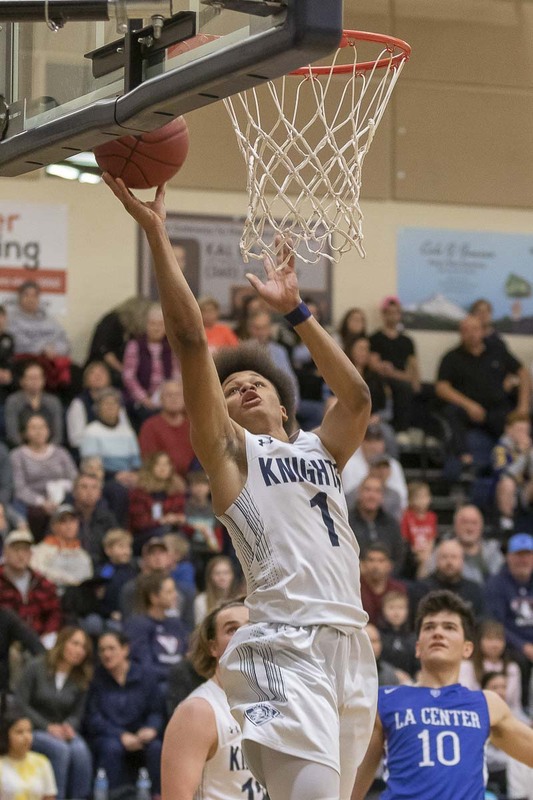 All of our guys are very skilled,” said Colby Shaw, who scored the game-winner with 1.2 seconds left in overtime for the 67-65 win over King’s Way Christian on Friday. That gave La Center three consecutive league titles. Four players on this team have scored at least 30 points in a game this season: Matt Bryant, Hunter Ecklund, Avery Seter, and Shaw. “Just depends on the night, who’s scoring. We get him the ball,” Seter said. Plus, the Wildcats have two more things going their way. Seter made his presence known Friday, scoring nine of his points in the fourth quarter. King’s Way Christian used a 9-1 run early in the period to take an eight-point lead. Seter got the comeback started with an assist to Ecklund, then he ended up scoring nine of his team’s next 12 points to force a tie. Halfway through overtime, though, it looked like King’s Way Christian had too much momentum again, going up five. When La Center missed two free throws with 90 seconds left, the Knights had the ball looking to go up seven. Ecklund got a steal and went coast-to-coast. Then it was Bryant’s turn to shine. He did not score in the fourth quarter, but made two free throws in the final minute of overtime and then tied the game with 21 seconds left on an offensive rebound and put-back and he was falling to the court. The Knights missed on their chance, and the Wildcats went on the fast break for the win. Bryant got the pass up to Shaw, who beat the clock for the lay-up and the victory. At least in the regular season. Now it is on to the playoffs. 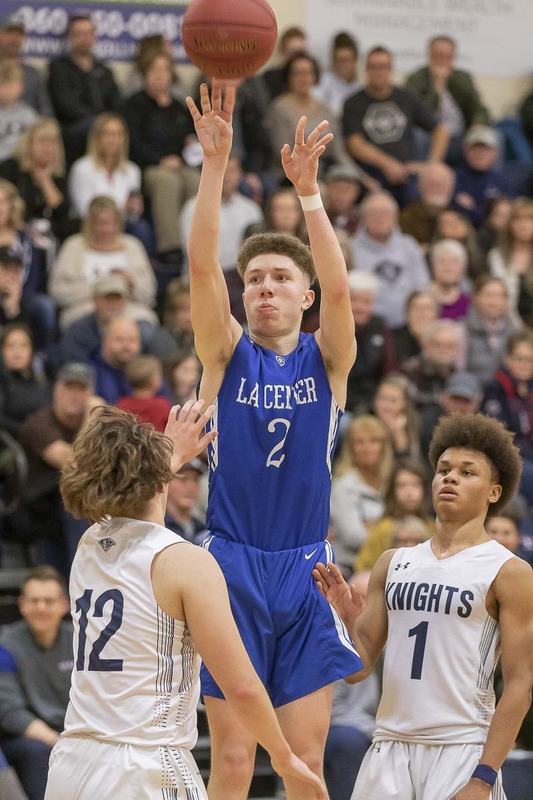 La Center will host Tenino at 7 p.m. Thursday in the opening round of the 1A District 4 tourney. Their coach says Hunter Ecklund and Seter set the tone for the squad with their ability to play better when the pressure is on the Wildcats. Their teammates then follow suit. Still, this has been an “interesting” season for the Wildcats, at least from the point of view of coach Jeremy Ecklund. That means he and his assistant coaches often go home wondering what’s with this group. “Very often,” the coach said. These guys are 18-2 and just won their third consecutive league title. “Yeah, it is working,” Ecklund said. And there is optimism for a big run in February and maybe early March. No matter what happens in the playoffs, though, La Center will always have that special comeback Friday that secured the Trico three-peat. The coach noted the banners that will be up in the gym. 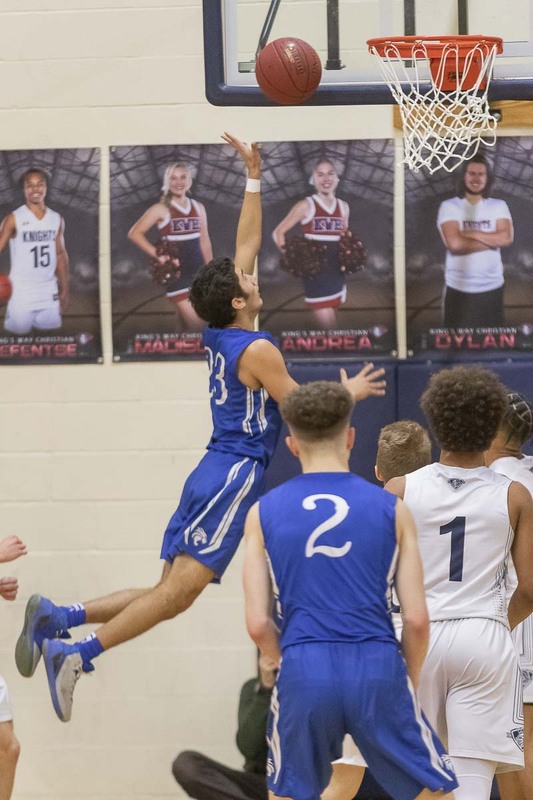 District tourney: King’s Way Christian gets a home game, too, to open district. The Knights will play Hoquiam on Thursday. Cool coaches: I have to believe all coaches in the region understand the value of high school sports. Winning, while important, is not everything at this level. It is about the journey, not just the destination. Still, I like to point out when I see coaches demonstrate those beliefs through their actions. I had to cover two games Friday night, one at 6 p.m. and the other at 7 p.m., so I missed the first half of the La Center-King’s Way Christian game. I didn’t feel right about fighting through the crowd to get to the press table, then sitting in front of someone who was there all game. So I situated myself next to our photographer, toward the corner of the gym near the baseline, close to the La Center bench. Some time late in the game and during a momentary break in the action, La Center coach Jeremy Ecklund noticed us. He walked over and commented on just how great of a game this was for all of us to watch. I believe his team was trailing at the time. Still, he just wanted to share with someone how much fun it was to be part of this game for a league title. The gym was packed, and the atmosphere was fantastic. Always good to see coaches enjoying the moment. Then after the game, as La Center players were celebrating their win with family and friends, King’s Way Christian coach Daven Harmeling made a point to greet the La Center players, too. This was long after the mandatory handshake line. This was a coach going out of his way to congratulate the opposing players for their fantastic effort.